In the future, our air conditioners will look like giant clouds of mist — and they'll follow us around. When we last checked in with MIT's Senseable City Lab, they were debuting a prototype heater that targets the exact space where you're standing. Now, the lab has created a system that does the same thing—for cooling. The idea behind both systems—which are meant to be experiments, not finished products—is simple: Why waste the energy to heat or cool an entire building or room when you could micro-target the space of a human, instead? The heated version, a system called Local Warming, was installed as a prototype in Venice last year (and, it needs to be mentioned, any resemblance to that Silicon Valley microwave joke was entirely accidental) and used servo motors, infrared lamps, and motion tracking to direct rays onto the locations where people were standing. This week in Dubai, the Lab unveiled the inverse and opposite sister project to Local Warming. It's called Cloud Cast, and it's designed with desert climates in mind. Measuring the time interval between sending the signal and receiving the echo to determine the distance to the floor, visitors passing between the sensor and the floor will produce an increase or decrease in this time interval, having either absorbed or reflected the sound waves respectively. Data from these sensors is fed to a central control system used to trigger hydro-valves and LED lights in proximity to the detected target. Based on your location and speed, nebulizers mist you as you pass. "In traditional systems, however, a lot of energy and water are consumed for cooling outdoor spaces, even when sparsely used," says the Lab's founder and director, Carlo Ratti. 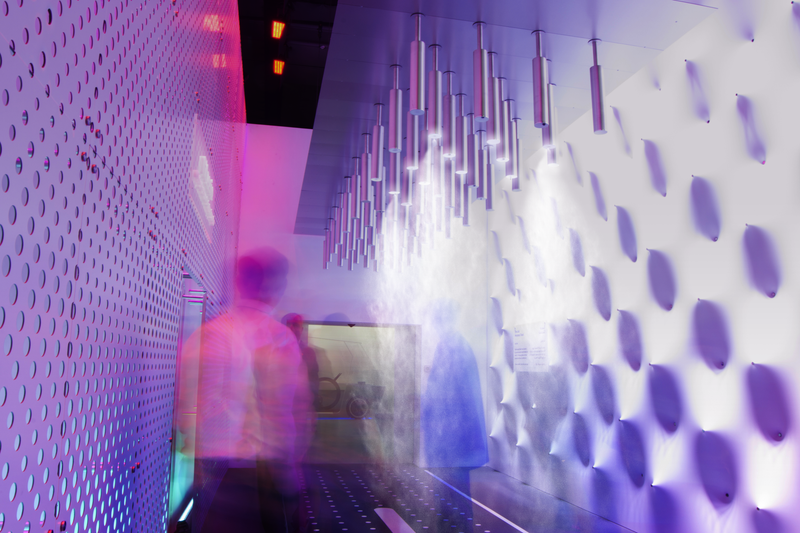 "In our project, we focus misting on people, gaining order of magnitudes in efficiency." It's just like the misters you'll find in hot, dry climates all over the world—except it's designed to waste less water and energy by misting one human-sized space at a time. Does that mean you'll be seeing this snazzy LED dreamscape anytime soon? Definitely not. Think of this as a proof of concept—an example of how, with a little jury-rigging, existing systems in our lives can be rewired to waste less and do more. All images courtesy of Senseable City Lab.